This is the first in a series of three LIVE workshops sponsored by Tutoring Services, LLC and Studyguide.net designed to provide participants with a comprehensive and methodical review of basic biology concepts, theories, and nomenclature. The series of three LIVE workshops will give participants the opportunity to review the information pertinent to the College-Level Examination Program (CLEP) general biology examination which allows participating individuals the chance to earn general biology college credit without taking the general biology college course. 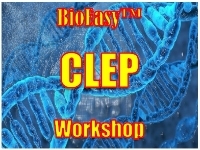 You are able to join virtually the excitement of BioEasy CLEP-Biology Workshop Part 1. Watch a high quality LIVE video stream brought to you by Tutoring Services, LLC. Enjoy, interact and watch the live feed from any of your internet connected devices. On Dec 10, 2015 19:00 EST to Dec 10, 2015 21:00 EST you will come back here and watch the show LIVE!! On behalf of Tutoring Services, LLC Cleeng teams provide support before, during and after the event. Due to high traffic just before and during the event, critical requests will be handled first, so please moderate your questions and only send if very urgent. Please try not to send multiple requests.